I've just returned from my occasional trip to the Netherlands, with my bags filled with new Dutch philatelic goodies. I'll be showing some of these over the next few blogs, starting off with a miniature sheet which I got from a very dear friend of mine (Hi Pim!). It's the 2012 version of the annual 'Child Welfare' issue. On the six different stamps we find the three daughters of the Dutch heir to the throne, Prince Willem-Alexander. 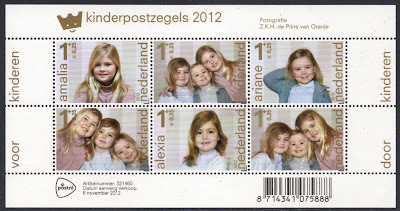 Top left on the sheet we find Amalia, the eldest and, if all goes according to plan, the future Queen of the Netherlands. She was born in 2003 and until now the only one from her siblings to be honoured with a stamp issue. 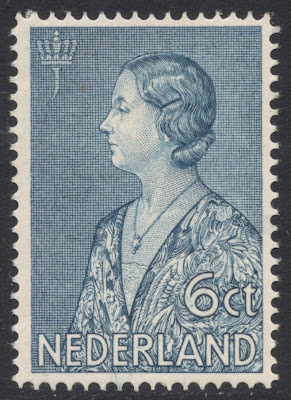 Royal stamp issues are less common in the Netherlands, compared to for example here in Britain, so this latest miniature sheet was welcomed widely by both the general public and the brotherhood of stamp collectors. It is extra special because the photographs of the three princesses have been made by their father, the Crown Prince himself, a fact which is mentioned in the top right corner of the sheet. Even more special is the fact that the whole issue harks back to the 1972 Child Welfare issue. 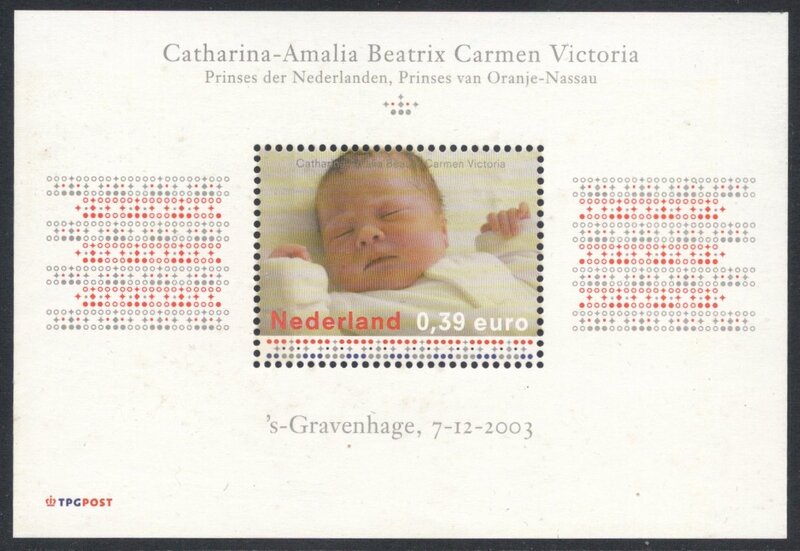 Again we have a miniature sheet with children, all boys this time, of a future Dutch monarch. On this particular sheet we see the boys of the current Dutch monarch, Queen Beatrix, with the top row portraying the same Willem-Alexander who photographed his girls for the 2012 miniature sheet. 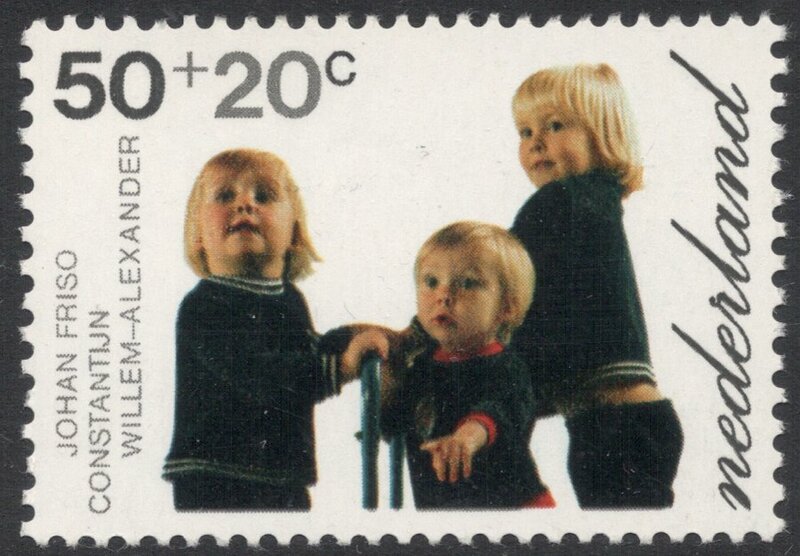 And this 1972 issue, too, was photographed by the children's father, the late husband of Beatrix, Prince Claus. In those days, the annual issue consisted of normal sheet stamps and a miniature sheet, with the top value of the issue only available in sheets. It is also the only value which portrayed all three boys together. Going back a bit further in time, we come across another similar issue, from 1946. Here we have the 'Princesses' charity issue, portraying the (then) three girls of Queen Juliana, with among those the future Queen Beatrix. 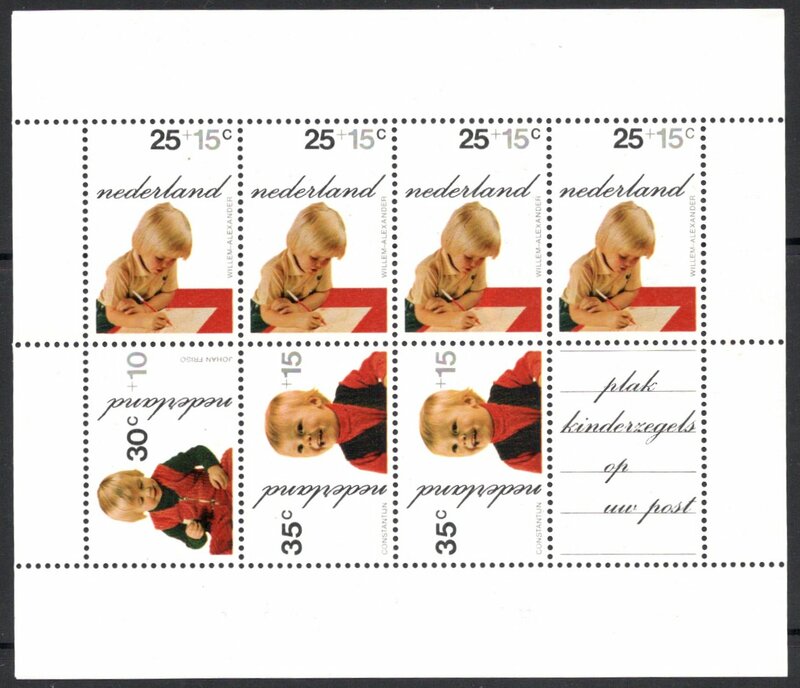 A set of six stamps in three designs. Daughter number four was born in 1947, so she missed out on this occasion. 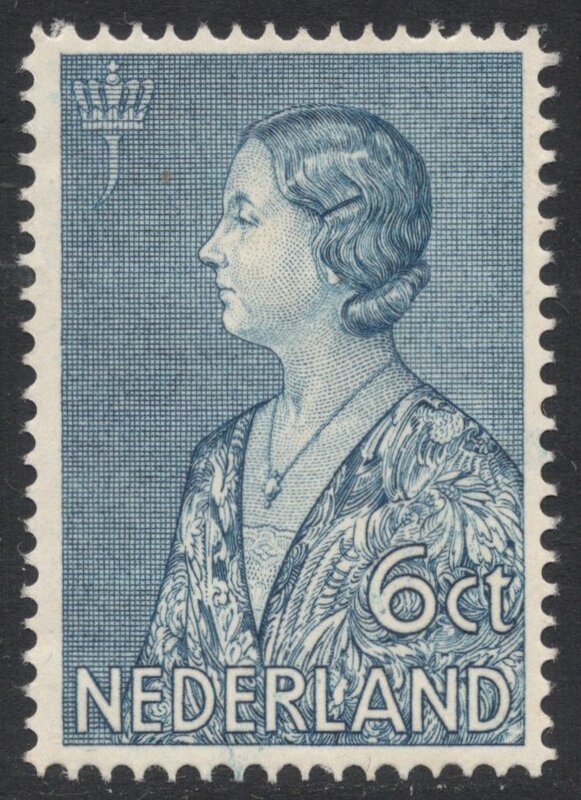 The first time an heir to the Dutch throne appeared on a stamp was in 1934, when two stamps were issued with a surcharge for the National Crisis Fund, of which Princess Juliana (for it is her we're talking about) was the founder. It's great to be able to chart the Royal Family in stamp issues, at the same time noting how stamp design and production changes, and with that the perception of the Royal Family and how it likes to be portrayed. 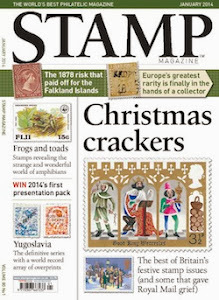 Who exactly then is featured in the very bottom stamp? It's great. Has some of the feel of a Japanese print. That's Juliana, at that time still Princess, later Queen (from 1948 to 1980). Thanks (I thought so but was not quite clear). Hope all is well. Looking back at it, it was bit vague, though the J in the top left corner is a bit of a clue! And yes, the dress she's wearing is a bit kimono-like, hence probably the Japanese feel to it. Well-spotted! Timely, timely, timely. We find out today that the Duchess of Cambridge is expecting. It's as if you have a hotline to St James' Palace.